Stevens – Australia’s Most Useless? Now, don’t you feel reassured? After all, if the esteemed Governor of the RBA is not worried, then why should you be? The nation’s most powerful economic figure has committed a double betrayal of working families – urging big banks to ignore the RBA’s official interest rate and saying taxes could be increased. For the second time in a fortnight, Reserve Bank Governor Glenn Stevens has gone public to encourage the biggest lenders to go beyond the current official interest rate and slug mortgagees at a higher rate. His controversial comments effectively render him useless – because it is a key part of his job as Reserve Bank governor to use official interest rates as a guide for the major banks as to what they should charge on mortgages. 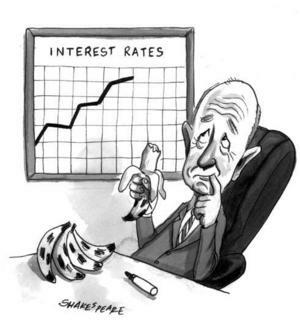 “I can’t tell you at what point rates will come down. I can’t promise they won’t rise. I can’t tell you that, mainly because I don’t know,” Mr Stevens said yesterday. Note the date of those comments by Stevens. April 4, 2008. His last interest rate rise prior to the GFC, was on March 4, 2008, taking the official cash rate to 7.25%. Less than 2 weeks after Stevens had again raised Australia’s interest rates, US banking giant Bear Stearns collapsed. Less than 6 months later, all hell broke loose with the collapse of Lehman Brothers… the biggest corporate collapse in US history. From September 2008, Stevens had to chainsaw 400 basis points (4%) off the cash rate, in a frantic bid to save the Australian economy from imploding. Remember that, for next time you hear the media again twisting Stevens words into an alleged putdown of Barnaby Joyce’s concerns.